If you think about it, acceptance is the only place from which we can see clearly and therefore act appropriately. Denial, resentment, resistance, magical thinking all cloud our vision, our problem solving, and decision-making. They impede our ability to garner the real lessons inherent in a situation. How often do you hear someone set a goal of being more centered, or conversely, lament being thrown off balance? This month I have been working with what it takes to move from a centered presence and noticing the perspective and freedom of choice it provides. It is more than a philosophical stance; it’s observable in others. When we describe someone as centered, we may note their quiet, their calm. We might observe a certain length in their spine, a quality of mental alertness, an organization of energy that blends strength and ease, rootedness and extension. When I feel centered, I am grounded. I inhabit my body, balanced front and back, side to side, crown to heel. It's a dynamic sensation—I have to shift my center of gravity as I move, as I respond to what is coming toward me or demanding my attention. In the human body, the center of gravity resides in the pelvis. It shifts as we bend forward or backward, stand equally on two feet or move asymmetrically, lower to sitting or rise to standing. When we move, it shifts. This fall, I was lucky enough to revisit the Foundations class for beginning yoga teachers taught by my teacher, Mary Lou Weprin. In each pose, the Center of Gravity must line up properly with the Foundation in order for Extension to occur. This alignment allows the muscles of the psoas pathway to do their job as a bridge between the legs, pelvis, and spine. Discovery of the Gravity Line will often provide movement hitherto unavailable to muscular exertion and can bring a sense of lightness and effortlessness to the practice. On my yoga mat, I stay connected to my center of gravity and my foundation as I move into Utthita Parsvakonasana, extended side angle pose. My front knee bends but I weight the pose in my back body. My top arm extends along my side body over my ear, as I exert equal and opposite energy from my waist to my back heel. WHAT DOES A CENTERED PRESENCE ALLOW? If I tend to lean in/forward, it is hard to have a clear and broad view. It takes a lot of effort to move any way but forward…and the reverse is true. When I move from a centered presence, I can see more clearly what is in front and around me. I have more choices in how I respond. I can wait and let my gaze be broad. I can choose not to engage or I can enter with intention. 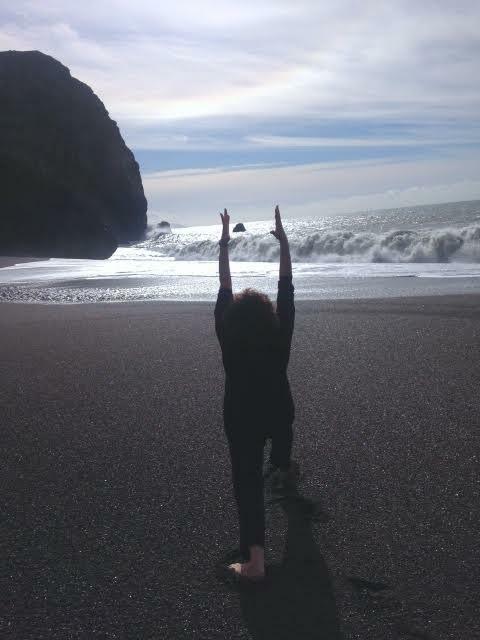 In my practice, I have been noticing how little I occupy the back of my body and how, when I cultivate a strong back body, I can move from a more balanced and grounded and discerning place. I am freer to respond rather than react. In this way, my actions are informed by physical intelligence: head, heart, and gut integrated. Each of us has our own way of returning to center, energetically, physically, and emotionally. It may be an activity that gets us in a state of flow or practices that train attention. For me, the core strategies are meditation, movement, and breath. Standing in line at the market, I move into my length, my breadth, my depth. What are your centering practices? This 4-week series is a great way to start or restart your practice. Limited to 4 participants, you'll get lots of individualized attention, group support, and referrals to local yoga classes. Please contact me if you'd like to be added to the waitlist. All intros have sold out to date. Just in Time: get clear about what's most important and figure out what you need to do to get moving and stay on track. Available in 3-hr blocks. Monthly Reflection Sessions: the appointment you keep with yourself to stop and make sense, to think and plan. Because leaders deserve it. When your leadership team, Board, or work group is stuck, in conflict or facing an important set of decisions, a few focused conversations can get you clear and moving into action. Click here for more information. Jessie Lyn Stoner's Blog: her post, 10 Things Every Team Leader Needs to Know, has excellent links and makes fantastic points. Gracious Space: A Practical Guide for Working Better Together: a tool for change and collective leadership. You can read the Kindle version right now. The Sheconomista Report: a weekly written by Lauren Lizardo. She chats with sass about money and life for everyday ladies and entrepreneurs. Over the last few months, I've been updating my website, laurapeck.co. It houses the resources and mentions I put in my newsletters. If you haven't stopped by, please do. I would love to hear what you need, what you are working with, and what tools and resources to which I can point you. Lastly, in the spirit of the Thanksgiving season, Gratefulness is full of prompts on living a grateful life. Enjoy. Happy Thanksgiving to you and yours. Ready to show up? Call Laura at 510.682.6133 or sign up to be put on the waitlist here. More information here. Price is $75 for the series. Discounts available for working parents, students, and under 35. Wear comfy clothes, come with an empty stomach and a yoga mat. Copyright © 2017 Laura Peck, All rights reserved.